Pokémon Go is ready to expand once again with the upcoming addition of trainer battles, offering the first real head-to-head competition the game has seen since it launched in 2016. Last week, Niantic invited Kotaku to try out this new mode at their offices, and much like the game itself, these battles are a little rough, but still provide some good entertainment as well as a foundation to build on in the future. Niantic’s offices sit right on the San Francisco piers in the historic Ferry Building, above a bustling marketplace that offers everything from fresh-baked bread to premium ice cream. The morning’s rainstorms had softened to a bluster, and the sun was beginning to break onto the Golden Gate Bridge nearby as I arrived there last Thursday. As I looked for an elevator, it took everything I had to keep from pulling out my phone to see what kinds of monsters were lurking among the Ferry Building’s pastries now that Pokémon Go has firmly taken hold of my life. I’m sure I wasn’t the only one. Pokémon Go has been a massive success for Niantic, with 800 million downloads and 147 million active players as of May 2018. The allure of striking out in search of fantastic beasts to catch and gyms to conquer forms the basis of the mainline Pokémon games, and the mobile version offered aspiring Pokémon trainers the opportunity to do so in the world around them. Earlier this year, it was reported that Niantic has made $2 billion from Pokémon Go alone. According to the developers, its players have walked 53 percent more in 2018 than they did the year prior. And since allowing folks to friend each other in June, players have apparently sent over 2.2 billion gifts to one another in pursuit of improved friendship levels and rare Pokémon. But one feature has always been missing: head-to-head battles. Pokémon isn’t just about befriending mythical creatures, but also training up an unbeatable team for competition against your fellow trainers. So far, Pokémon Go’s updates have mostly been geared towards cooperation – taking down another team’s AI-controlled gym is about the closest one could get to facing off against other players – but the next big addition is all about giving players the chance to see how they fare against the rest of the world. Trainers can scan each other’s QR codes to battle, or even engage in practice bouts with Pokémon Go’s team leaders. The most important question the Niantic developers asked themselves, they said at the meeting last week, when starting work on Pokémon Go’s player vs. player mode was: “What does it mean to be good at Pokémon?” They wanted players to be able to use classic Pokémon knowledge like type and move advantages while also ensuring that users who were already good at Pokémon Go’s gym battles would be good in head-to-head competition. A happy medium would be important to the mode’s overall success. Anyone who’s played Pokémon Go knows that battles work a little different than in the main series. They put a greater focus on simply overpowering the other Pokémon with normal attacks and building up to a super move, rather than anything super deep or tactical. Sure, things feel a bit more like the anime with the ability to dodge, but the mobile game’s underlying jankiness makes it hard to do anything but mash out attacks until you win. Competitive matches between players will play out in much the same way, but with new mechanics that add a few layers of much-needed strategy. Player vs. player battles will play out in real time. Each participant will build a team of three Pokémon and essentially tap their way to victory. Much like the current battle system, tapping anywhere on the screen will make the active Pokémon use its basic attack, which in turn builds up a meter for a stronger charge attack. Once the charge attack is ready and players choose to use it, they will be asked to tap the screen some more to power it up through a timed input challenge. The more you tap in the few seconds you’re given, the stronger it becomes. The fight will continue in this way until one player loses all their Pokémon or time runs out, whichever comes first. Niantic’s designers said they limited the teams to three Pokémon instead of six because, in playtesting with the larger squad, they found that battles focused too much on switching for type advantages and, ultimately, the first and last Pokémon ended up becoming the most important members of the team. Battles also took way too long with six Pokémon on each side, so limiting each trainer to a team of three means fights will be “fast and tactical” according to the developers, allowing players to participate in more battles in a short amount of time. Furthermore, switching relies on a cooldown system, meaning trainers used to the counter-heavy competition of the mainline series won’t be able to consistently switch Pokémon in and out of battle in an effort to gain an edge on the opponent. Pokémon can now be equipped with two charge attacks, adding new strategy to trainer battles. A bit more strategy has been added into the mix with the ability to unlock a second charge move for each of your Pokémon. These moves, which will cost a still undecided amount of Stardust and Candies to unlock, come from the same attack pool as the first charge move, but give battles some much-needed diversity. Charizard, for instance, can be equipped with both Fire Blast and Dragon Claw, giving it two different types of moves to choose from in battle instead of just one. Upon using one charge move, however, the energy that has been built up for both moves will be depleted, so trainers will need to make a decision between one or the other depending on what Pokémon they’re fighting against. Trainer battles do away with the dodging seen in other modes, replacing it with a new item called a Protect Shield. When one player builds up their charge move, the other is asked whether or not they would like to use the new defensive item, which absorbs most of the damage. With the addition of a second charge move to each Pokémon’s moveset, players will need to make careful decisions as to when they want to defend against a possibly super effective move or tank through it in order to save the shield for a different moment. During our play test, both trainers were allotted two Protect Shields to use in each battle, but the developers said they were still finalising many of these minute details for the official release. 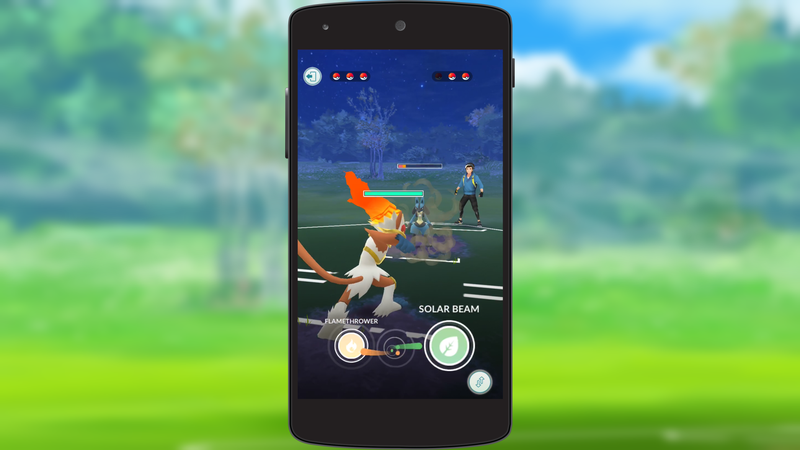 In line with Pokémon Go’s social aspects, Niantic is hoping that most player-vs.-player matches take place face to face. 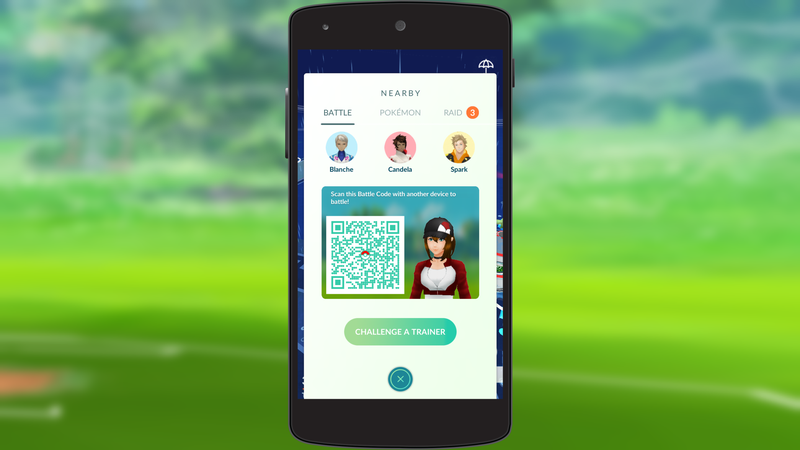 As such, players will be able to challenge fellow trainers out in the world by scanning the potential opponent’s personal QR code. Trainer battles are coming out at this point in time, the developers said, because they wanted players to become familiar with the social dynamics of Pokémon Go via the friend system before sending them out into the world in search of battles. Engaging in battles with another player also raises your friendship levels, despite the competitive nature of the mode. Players will also be able to battle with friends remotely, but they must have already reached the Ultra rank or higher, and rewards will be limited to an unspecified amount of battles. Finally, trainers without anyone nearby can train against in-game team leaders Blanche, Candela, and Spark, earning rewards on a much more limited basis. While they sound exciting in theory, Pokémon Go’s new trainer battle mechanics don’t always work as intended in practice, I found during my hands-on session. This might have been due to playing on an early build of the mode, but trainer battles during this preview were hampered by issues similar to those that plague the rest of the game. When fighting against another player with little more than a foot of space between us, we would frequently become desynced and have to wait for a series of animations to play out on one phone or the other before battle could resume. Switching Pokémon simply wouldn’t work at times due to the menu disappearing, and the decision on which Pokémon to send into battle after one was knocked out was taken away altogether by the same bug. Like Pokémon Go as a whole, trainer battles are ambitious but feel restrained by the game’s shaky foundation. Win or lose, both players will earn rewards for taking part in battles, although the winner will obviously get a bit more out of the exchange. These rewards include “hard-to-earn evolution items” and items that are focused on “improving Pokémon.” The demo we played regularly handed out Sinnoh stones, the newly-added tools that evolve a specific set of early-generation Pokémon, like Magneton and Murkrow, into forms from more recent games, like Magnezone and Honchkrow. Again, these rewards are still being finalized for the official release. 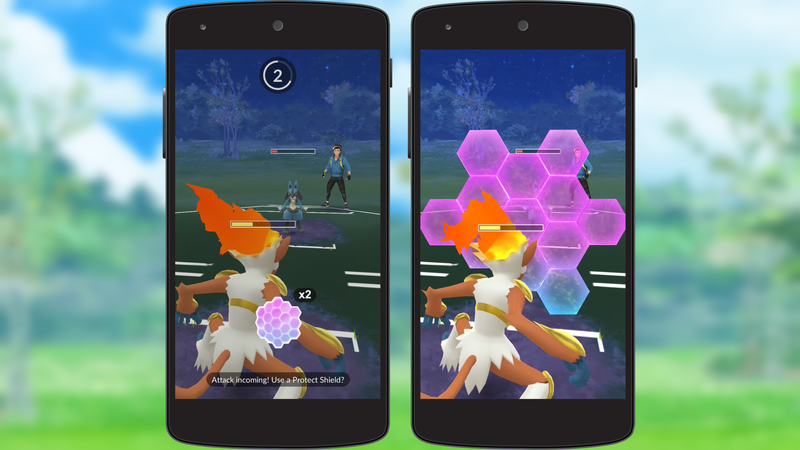 Making snap decisions about when to use your Protect Shields will be a major part of winning Pokémon Go trainer battles. In developing these trainer battles, Niantic pulled from a number of concepts from Pokémon history. Like the Pokémon Stadium franchise’s Cup system, Pokémon Go’s competitive mode will be split up into three separate leagues, chosen before the battle begins. Great League battles cap Pokémon at 1,500 CP, Ultra League maxes out at 2,500, and Master League extends to 10,000, essentially making it a free-for-all for trainers to use their strongest Pokémon. And the way you find matches, the developers explained, is meant to mimic the now-archaic practice of meeting up with friends and connecting old-school Game Boys with a link cable. Even with its issues, some of which might not even survive to the final build, trainer battles in Pokémon Go are fun. Not as fun as they can be in the main series, of course, but a welcome diversion to the mobile game’s other offerings. It might just be the natural competitor in me, but I made sure to power up some of my favourite Pokémon with additional charge moves before challenging my fellow journalists, and felt a distinctive frustration upon losing. I’m proud to admit that I didn’t curse in the presence of these other professionals, but I didn’t find it hard to imagine frantically hammering my phone’s screen in an effort to destroy trainers out in the real world and studying my current crop of Pokémon for any means of improvement once the mode is released. Niantic said that it plans to continue adding to trainer battles as time goes on, including more complex mechanics based on the traditional series, but it wasn’t ready to start talking about what might make the jump to Pokémon Go. For now, the developers are hoping to create a fun, laid-back atmosphere through these battles, giving everyone an opportunity to test themselves while making sure there’s nothing to lose by accepting a challenge from a fellow trainer out in the wild. Apart from the League system, there are very few rules, and that’s by design: Niantic said it isn’t looking to run competitions, and the developers are happy to leave any sort of organising up to the players themselves. Pokémon Go isn’t a perfect game. It’s still pretty rough around the edges, years after release. But the exploration and growth it asks of players perfectly matches the feelings evoked by the rest of the Pokémon franchise. As a kid, my one wish was to visit the world of Pokémon and catch my very own Cubone, travelling the world with a cute little friend by my side and earning gym badges en route to becoming a world champion. I’ve since learned that that is impossible, but Pokémon Go is the next best thing to visiting Kanto and Johto, and trainer battles are just another piece of that puzzle. Many of the most exciting aspects of Pokémon Go started small and unwieldy, and I can’t wait to see where trainer battles go after such ambitious beginnings. Bring it on!